We spotted these cool platform boots recently at Venustus, and they brought us back to Utopia, which we hadn’t visited in too long. I love when things work out that way. So this is Chameleon, by Utopia Design, a calf-length boot - not that common in our experience in SL. It comes in a variety of good colors, but I stayed with the red on these pictures because it’s quite striking. Great folds and reflections, brilliant colors and terrific laces, visible from a good distance. The color adjust HUD is extremely smart, so I’ll give you the Marketplace link so you can see it before you buy. Ok these should keep you happy for months if not years, Elisabetta has taken the next step in color adjustment on footwear. The boots come with a HUD that lets you adjust the 7 parts of the boot: shaft, upper, tongue, platform and heel, laces, eyelets and sole. In the middle of the HUD, you see how your boot will look, though that is hardly necessary as the color change happens very fast on these. The HUD also offers you 8 presets for the most common options, your sound control and resizer, which is one of the quickest working ones if seen yet. As the boots are copy you can adjust them to fit your favorite outfit and add them to your outfit folder for ease of use. 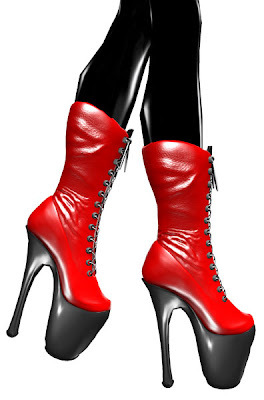 These boots, especially with the transparent platform are a must for every self respecting stripper in SL.